Below I’ll assume that you have IIS 7.x installed on your local machine. 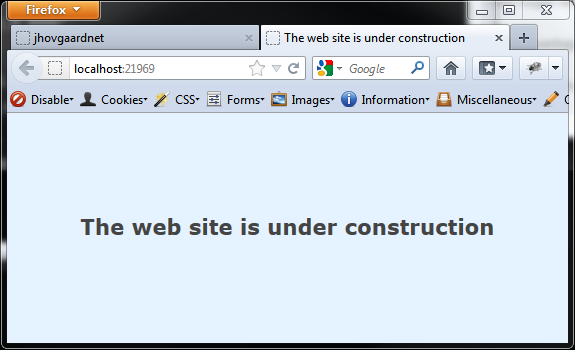 If you want to go live with Kudu, simply deploy the Kudu.Web project to a site on your production/online IIS as usual. Now open up the Kudu.sln in Visual Studio. Mark the Kudu.Web project as active (makes it bold) and hit CTRL+F5. Click the “Create application” link in the top menu. Enter a preferred name for the IIS site (I.e. “jhovgaardnet”). Click the blue “Create application” button. It tells the URL to the Git remote we can push apps to, the URL to the site itself and the service URL which actually is the Git remote from before. So Kudu is creating 2 sites with a kudu_ prefix. The first is the main site, the one hosting your application. 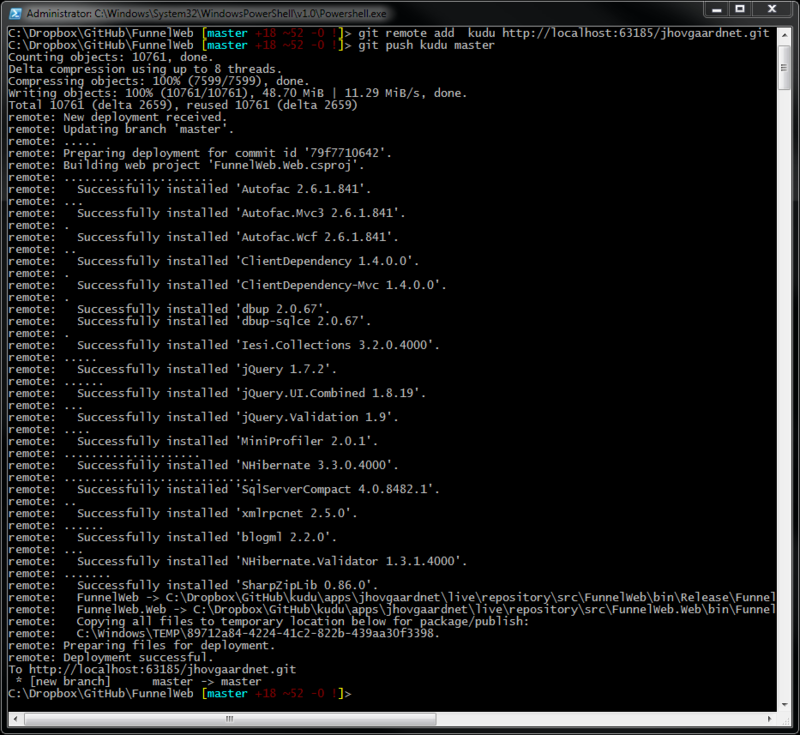 The second is the “git remote site”/service site. Both sites is running on the same application pool. Now updating the application URL shows my fully deployed blog, just as expected. Yes, it’s freaking awesome! The next thing for you will be to deploy Kudu on your production IIS, setting up sites as Kudu sites, setting correct bindings, etc. I really think Kudu is swell and I hope to see some interesting forks of Kudu that moves it closer to a continuous integration system with Github hooks, unit testing abilities, etc. TeamCity is cool, but it’s expensive and heavy. We need a slick open source .NET alternative and I hope Kudu is the beginning! What do you think? Can you see the possibilities? Are you going to use Kudu? Visual Studio 2012. Note that you need to run it as admin. Install/Update to the latest version of NuGet Package Manager (Tools -> Extensions and Updates). IIS >= 7, configured to run ASP.NET 4.0. This can be installed using WebPI. Install Git (http://git-scm.com/downloads) to the default location (we expect it in C:\Program Files (x86)\Git\bin). Install Node. Node is used as part of the build process for sites. 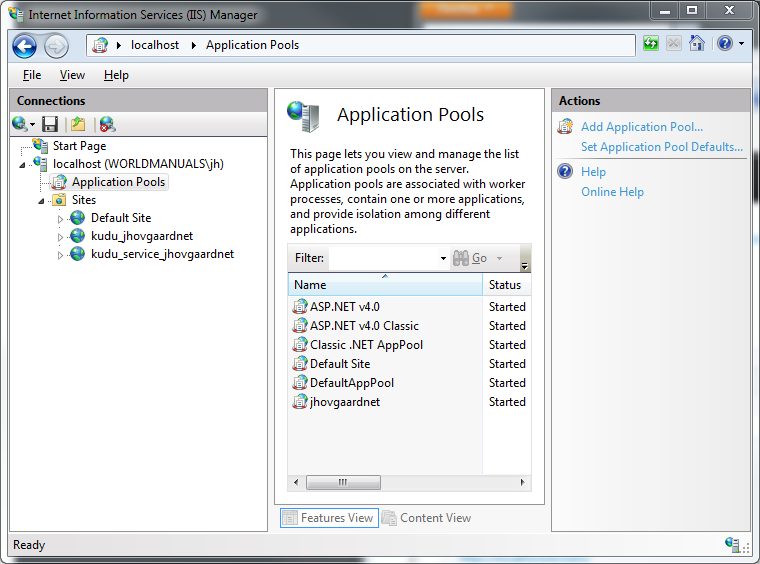 Open your %WINDIR%\System32\inetsrv\config\applicationHost.config and look for<applicationPoolDefaults>. Under <processModel>, make sure you don’t havesetProfileEnvironment="false". If you do, set it to true (or remove the attribute if you are running the latest Windows 8.1). Install the URL rewrite module for IIS. Copy your \Program Files\nodejs folder to \Program Files (x86)\nodejs. Under \Program Files (x86)\nodejs, you need to have a folder named 0.8.2, and containing node.exe version 0.8.2. And then same deal for Node 0.10.5. Yes, this is kind of painful, and we need to make it easier! The Web and WebApplications folders need to be present under \Program Files (x86)\MSBuild\Microsoft\VisualStudio\v10.0. If you don’t have them, you may need to copy them from a machine that has VS 2010 installed. This is needed because some of the test apps target these. TODO: we need to make this easier! Open Kudu.sln as Administrator and build it. Set Kudu.Web as the startup project and run! 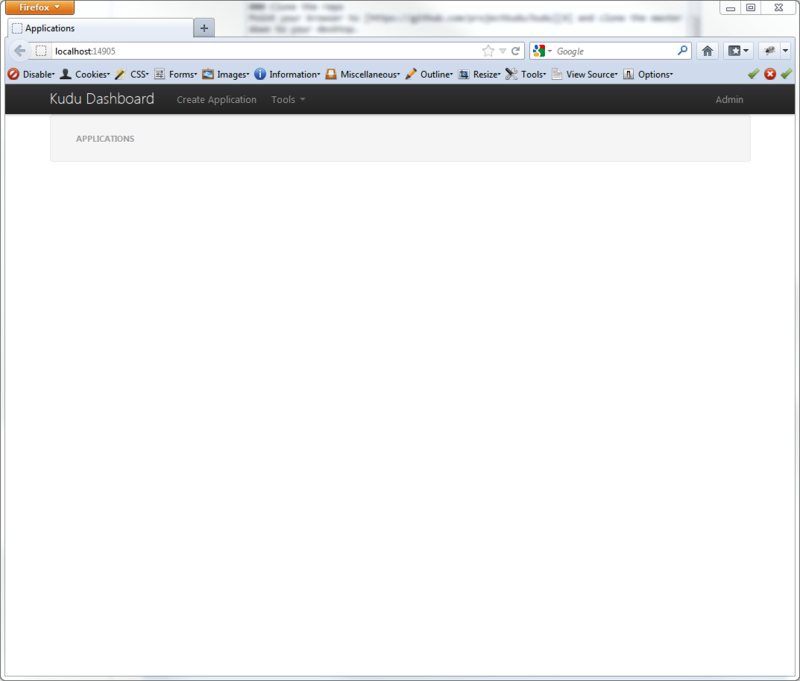 After running Kudu.Web, you should be able to use the dashboard to manage your application. 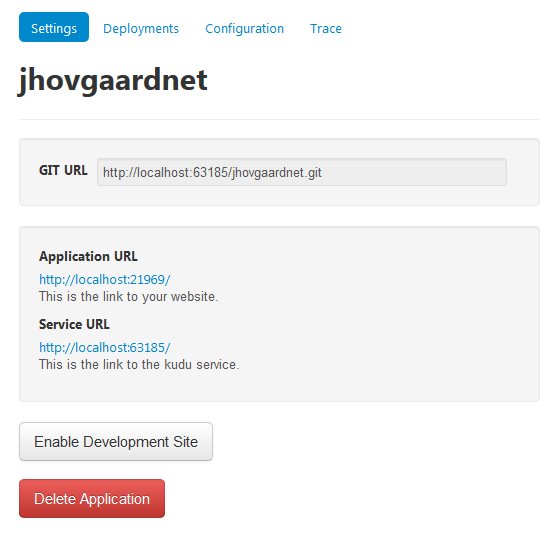 Below is a walk through on how to create and deploy your first application using git. Copy the git url and push.